Moonshine, white lightning or hooch if you prefer, is one of the ways that we could get alcohol if we want, and in times of great restriction like The Prohibition era, it was probably the best way. But we don’t really need moonshine anymore, now that there are so many other kinds of alcohol out there, with interesting flavours, and which undergo incredible distillation before being released into the marketplace. But what the heck does that have to do with this movie review? You’re about to find out. Camille Delamarre is a French editor and director. This is his second time directing for the big screen and his previous work was the District 13 remake, Brick Mansions, which featured the greatly missed Paul Walker, David Belle, and RZA. Brick Mansions was rated very poorly, but I personally really enjoyed it. I might be slightly biased as I am huge Paul Walker fanboy, and I’ve never seen the original District 13. So I had high hopes. But were they misplaced? Let’s cover the story a bit before I detail my thoughts. It’s 1995 in France, and a group of teenage prostitutes see a van roll up and a man get out, then opens fire on the group. The man, a Russian named Arkady Karasov (Radivoje Bukvic) and his partners, Yuri and Leo Imasova kill many of them, but let one pimp survive to share the story. One of the girls, Anna (Loan Chabanol) is traumatized by what the events. Meanwhile, Karasov recruits Maissa, one of the previous pimps girls as his own and she gets in his car. Karasov then yells at the other girls to get to work. Anna stands there crying. Fast forward 15 years and Anna receives a call while eating and tells the other party that the plan is in motion. We see a group of six thieves coveting a black Audi. The owner, Frank Martin (Ed Skrein) watches and use his phone to open the doors and knock two of them over. The gang leader notices Frank and demands the keys. But Frank disagrees and he disables them all with martials arts. But not before realizing he is now late and driving away quickly. Frank greets his father Martin Sr. (Ray Stevenson). Martin Sr. tells his son that he late and they start discussing Martin Sr’s retirement. Frank recieves an unlisted phone call, but declines to answer while driving. Meanwhile, Qiao is waiting in a hotel room with two men for Anna to arrive. The accountant is upset that she is late. When Anna arrives she shoots the accountant and guard almost immediately. They then drop another dead prostitute in the mix, and set the room on fire before leaving. Frank and his father are having dinner while they discuss what Martin Sr. has planned for the future. We learn that Martin Sr. was likely a spy during this exchange just before Frank gets another call from the unlisted number. This time he answers and Anna asks him about a job. They agree to meet for 2PM the following day. Karasov is on his yacht with Yuri, Imasova and Maissa who is now his kept woman. They learn that there has been an “accident” with the accountant. Karasov and Maissa meet with Inspector Bectaoui (Samir Guesmi) who wants Karasov to identify the woman and if she is one of his “hostesses.” Karasov doesn’t like the implication and makes a threat to the inspector before leaving. Frank meets with Anna and covers his terms. No names, no changing the deal mid transaction, and he cannot know what is being transported. This is for his own protection. Anna agrees and explains he will be transporting her and two packages which total 104 kilos altogether. This will happen at the Mediterranean Bank in three hours. And that is the end of that, as they say. Pros: It is incredibly efficient and both the story and action keep up the pace quite well. If you’ve seen the original trilogy, you’ll being entertained, however mindless it is. Cons: It’s efficient to the point of being sterile and doesn’t live up to previous entries. Points of Interest: Ed Skrein left Game of Thrones to make this movie. This is not a prequel of how Frank Martin became The Transporter, it’s a retelling. Which is pretty telling I think. There are so many better action movies out there at this point, that something so methodical and derivative just isn’t going to make a big enough mark. You should probably just drive away from this one. Moonshine tastes pretty “good” when well made and when you don’t have a lot of options. But it’s also incredibly powerful and can make you very sick if done wrong. So why put yourself through that experience, especially when some people make it from car radiators? 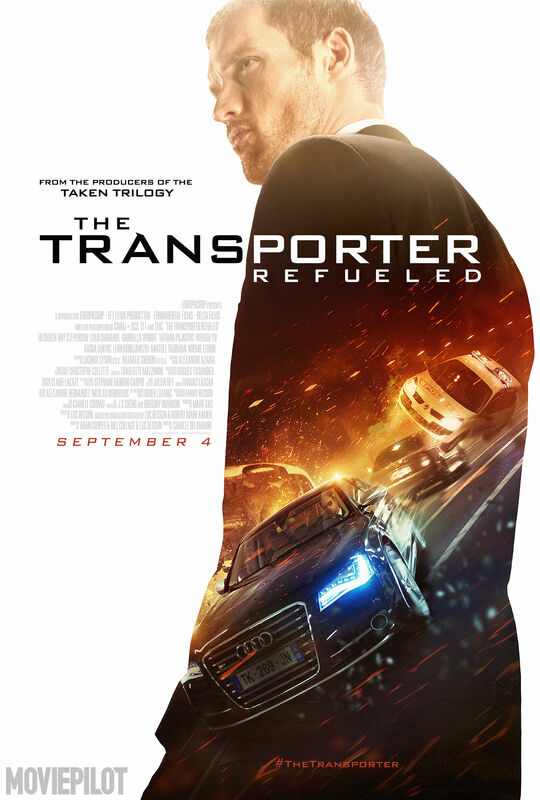 The Transporter Refueled reminds me of moonshine because it can do the basic trick of being visually interesting and fits the genre, but just isn’t as enjoyable as other offerings. Plus I don’t want anyone to be blinded by this. See you tomorrow for some wisdom. Please leave comments and thoughts below!